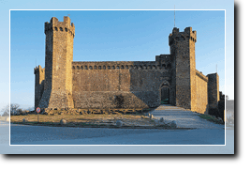 Montalcino is perched on top of hill overlooking the Val d’Orcia, the Val d’Arbia and the Valle dell’Ombrone. 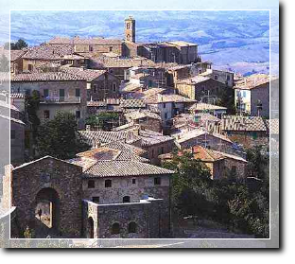 A town having atypical medieval layout, Montalcino offers its visitors the Palazzo Comunale, the Cathedral and the churches of S. Agostino, S. Egidio and S. Francesco. In the Archaeological Museum you may see a number of interesting prehistorical and Etruscan findings from the area whilst in the Museo Civico may see two terracottas by Andrea della Robbia. Montalcino, though, is, above all, the home to one of Italy’s and Tuscany’s most important wines: the Brunello di Montalcino: made from pure Sangiovese vines grown in the nearby hills this wine is one of the best expressions of a territory and a landcspae which are the very heart of Tuscany. 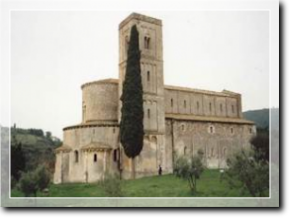 In a valley 10 km from Montalcino, Sant’Antimo stands high and seems to welcome its visitors inviting them to stop a while to regenerate body and soul. The Abbey in fact does give sensorial trips to its guests either under its majestic arcades or under its ancient olive trees which surround the abbey itself.